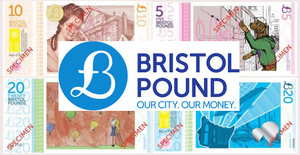 The Bristol Pound (£B) is the UK’s only city-wide currency, it’s designed to help the economy in Bristol grow by keeping all the money spent locally, in the area. Consumers can already use the Bristol Pound for a wide variety of products and services, from paying their tax to buying their weekly food shop. Now in a big victory for the city, the renewable energy company Good Energy are allowing citizens to pay their gas and electricity bills with the local currency. “This is the world's first, there’s simply nowhere else you can pay for your gas and electricity with local currency. We’re incredibly excited to be leading the way by inviting our customers in Bristol to support green energy and their local economy at the same time.” Not only this, but Green Energy also give staff who live in Bristol the option of receiving some of their pay in the Bristol pound currency. The hope in Bristol is that other energy companies will start to follow suit, the Mayor of Bristol, George Ferguson said: “Bristol Pound is a tangible demonstration of the way Bristol does things differently, and it’s gone from strength to strength since it was first introduced. Green Energy has calculated that if just ten percent of Bristol residents switched their supplier to Good Energy, it would be able to save 30,000 tonnes of CO2 every year, the equivalent of taking 18,900 cars off the roads.